Preheat the oven to 350˚F/180˚C. Line a baking sheet with parchment paper. 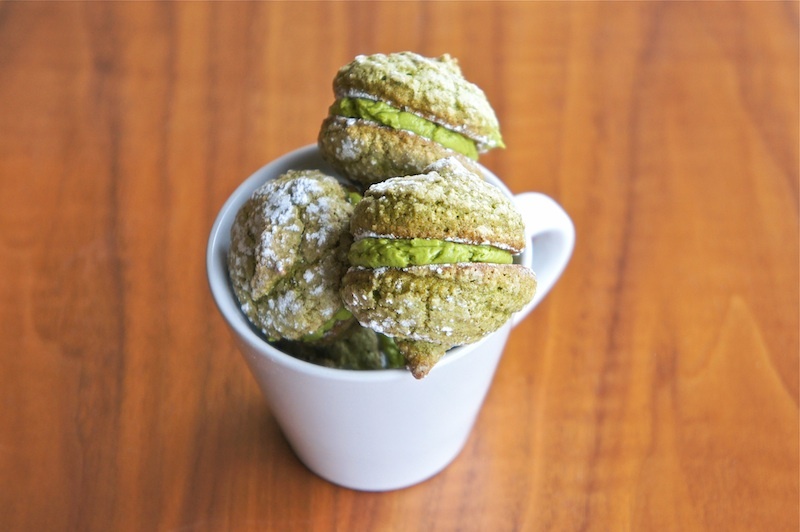 Sift ground almonds, confectioner’s sugar and matcha with a coarse sieve twice. Set aside. Meringue: Combine castor sugar and egg white powder. Beat the egg whites until foamy. Add sugar and egg white powder mixture and beat until egg whites are glossy, with stiff peaks. Add sifted almond mixture to the meringue and fold gently to make the dacquoise batter. Transfer batter into a piping bag fitted with piping tip. Pipe out small discs (about3.5 cm in diameter) onto parchment paper. Dust with confectioner’s sugar twice and bake for 15 to 20 minutes until dacquoise rises up completely and surface becomes dry. Matcha Cream: Beat the butter until pale and creamy. With a clean bowl, beat egg whites until foamy. Add half the sugar and continue beating. When egg whites have achieved some volume, add remaining sugar and continue to beat until glossy and stiff peaks form. Add meringue to butter and mix thoroughly. Add matcha and fold well. 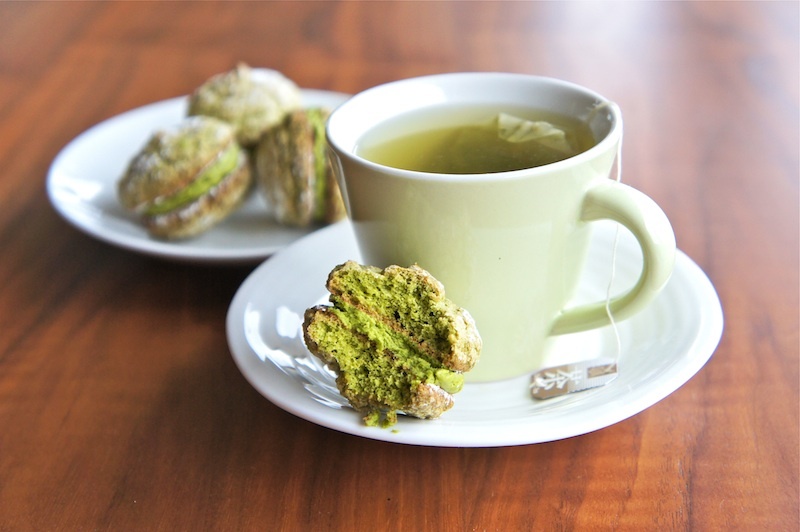 Transfer the matcha cream into a piping bag fitted with piping tip. Pipe cream onto flat side of the dacquoise discs. Top with another disc, flat side down. For best results, make dacquoises and assemble them the day before serving and let chill in the refrigerator. They can be kept for up to 3 days. They look so delish! Will be my snack on tea time tomorrow!!! What's Egg White Powder ? this is beautiful, i must make this soon. mmmm this looks so delicious. Matcha + anything is a win in my books. I'm obsessed with green tea. @caja de sabores: Egg white powder is also known as meringue powder.